This post is sponsored by Joann Fabric and Craft Stores. Thanks so much for supporting the brands that keep the crafts coming! Summer is finally here and I will be spending all my free time outdoors soaking up the sun! 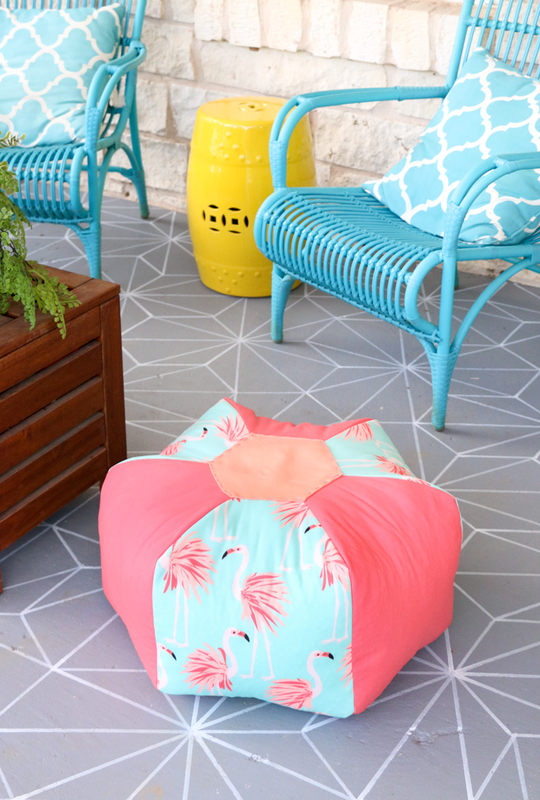 I recently repainted my patio and now I am in the stage of adding in lounging decor, and this DIY outdoor pouf is the perfect addition. 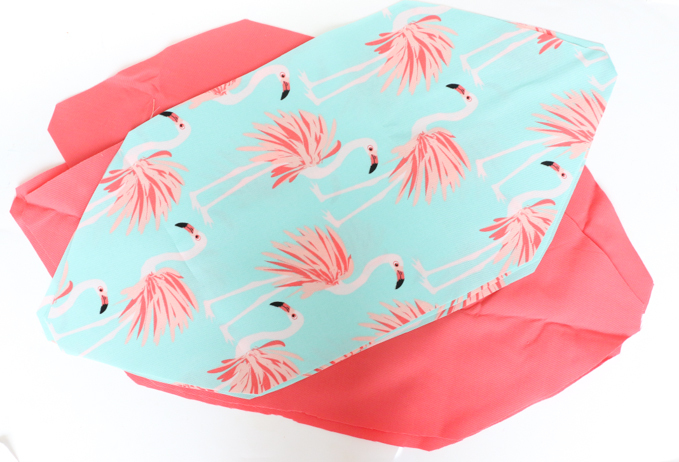 I love the combo of the flamingo fabric and the solid coral fabric! This was also my first time making a pouf and I was surprised how easily it came together. 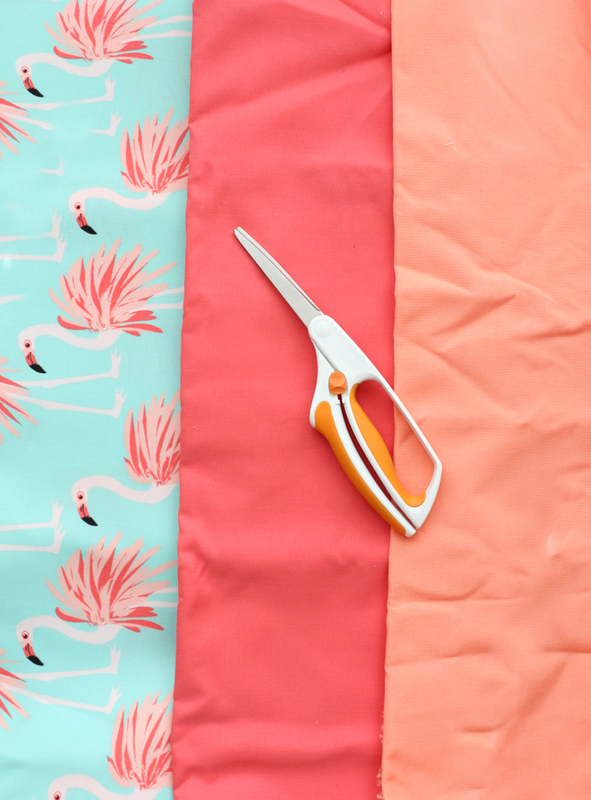 Begin by cutting out 3 pieces of 26” by 12” strips that taper to a point on each end from each of the 1-yard cuts of fabric. Pin one solid and one patterned piece right sides together on one side and stitch together. Now pin on another solid piece to the edge of the patterned piece and stitch together on that side. 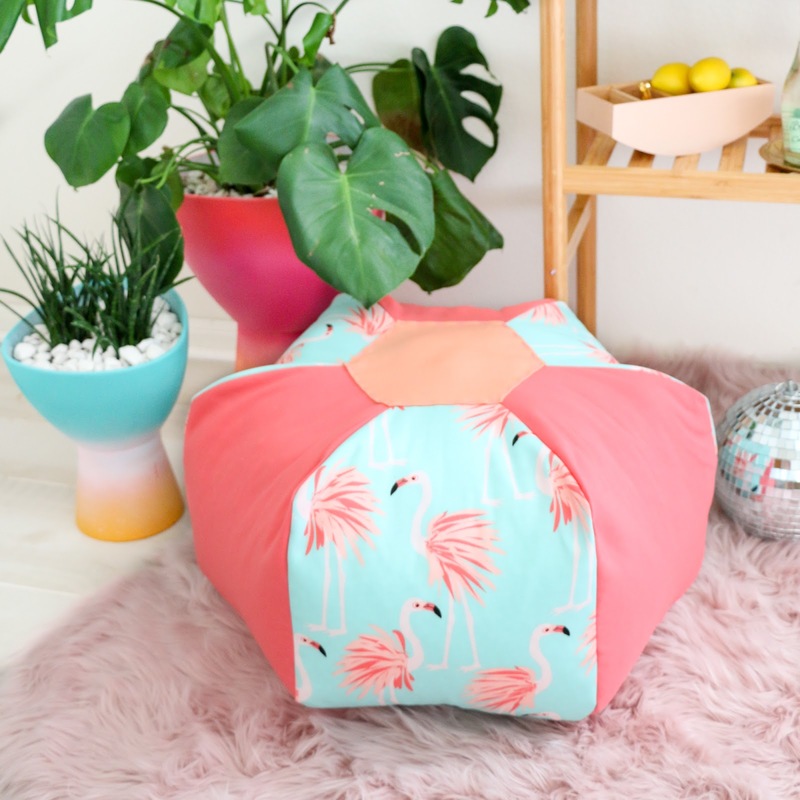 Repeat until all 6 pieces are stitched together to form the pouf. Fold the pouf in half-length wise and stitch the bottom opening together. Then turn right side out. Gather the end of the bag of bean bag filler and stuff into the top opening and fill the pouf with as many Styrofoam beans as possible. 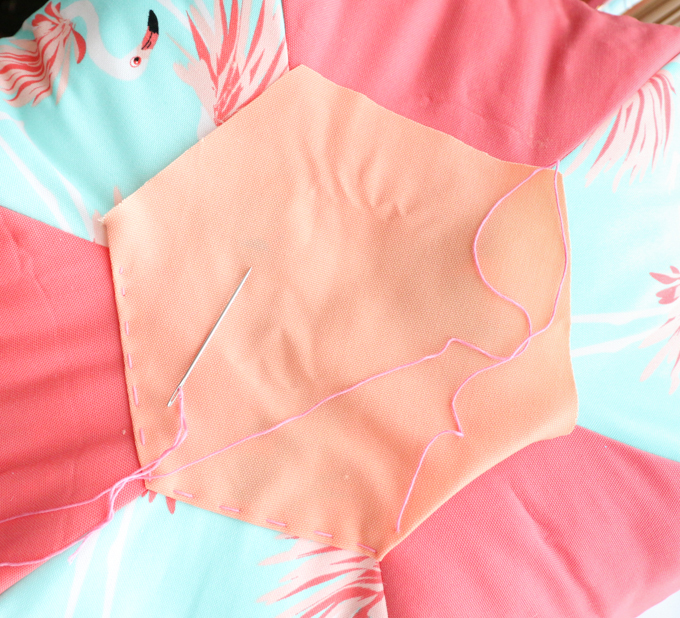 Then cut a hexagon shape 2-3” larger than the opening on the top out of the coordinating solid and use the needle and embroidery thread to decoratively stitch on the hexagon making sure to fold in the sides as you go. 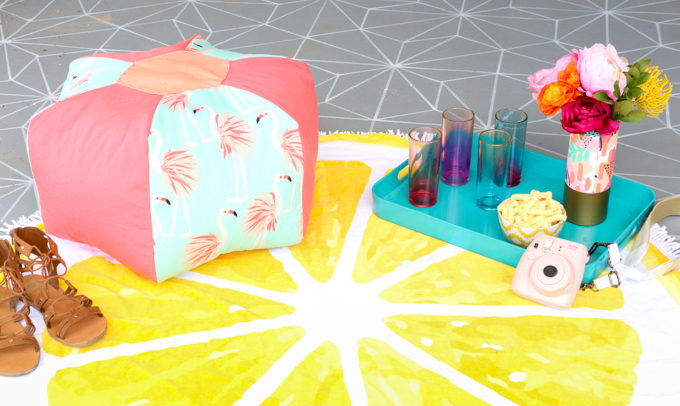 Once you have finished stitching on the hexagon, your pouf is ready to use! 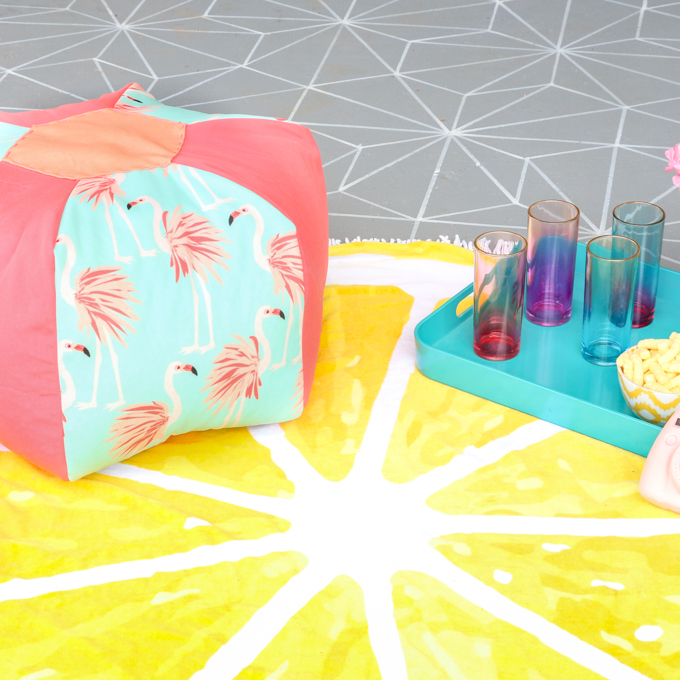 I love that by using outdoor fabric, the pouf can withstand the elements out on my patio. 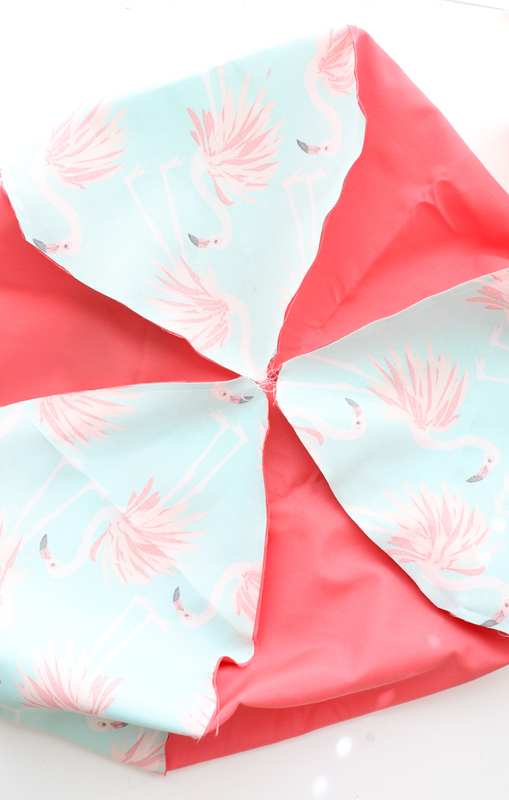 And how perfect is the flamingo print for summer?! I am thinking I might make a few more so that everyone can lounge around this summer with me!